Larger than life sound systems, tricked out BMW’s, beauty pageant queens on a “La Flor Food Seasonings float,” and men and women in traditional dress and dance paraded along Graham Ave., marking the 18th annual Williamsburg Dominican Parade. 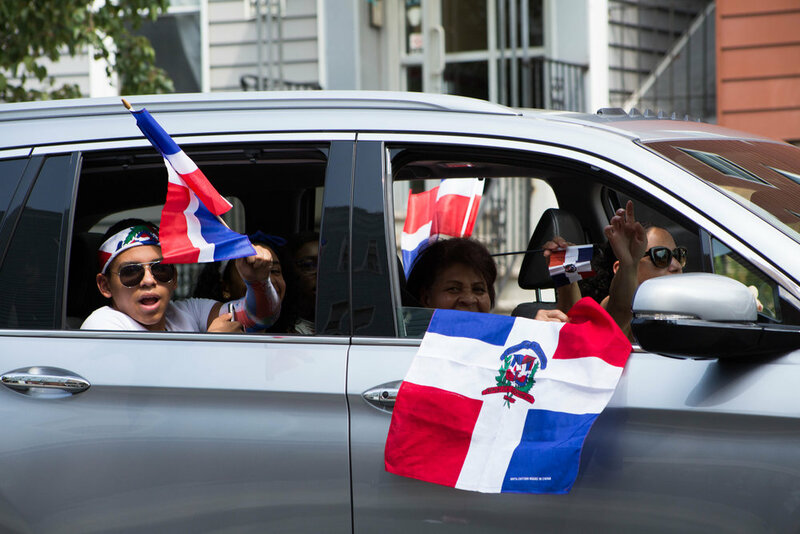 Starting at Metropolitan Ave. and continuing along Graham Ave. to Broadway, the Dominican Parade is a celebration of Dominican culture and influence in the neighborhood. The event is thrown by Brooklyn Dominican Parade, a 501c (3) organization started in 2000. Like many things Dominican, the parade was loud, vibrant, and full of life. The heart of the parade, a large and decorated “La Flor” spices and condiments float, held beauty pageant winners and local residents and community figures. Walking alongside the Float were NYPD units, dancers, a Dominican cycling team, and “La Orden Verde,” an environmental group, dedicated to preventing the exploitation of natural resources in the Dominican Republic. Men and boys both young and old, dressed in carnival costumes with sequins from head to toe with images of Dragon Ball Z characters and or National colors embroidered on their backs and masks that towered high above the crowd, cracked large bore whips called “Fuertes” or “strongs” in English. The whips created a sound that was loosely comparable to the sound of gunshots being fired, leaving any lucky bystander within a close enough range with a ringing ear. Christian Colon, 22, dressed in a carnival costume and wielding a whip explained that that “every region [of the Dominican Republic] has a different costume.” His costume was referred to as the “Lecho de Santiago” and represented a celebration of their ancestors and agricultural history. But carrying the true rhythm of the parade were vans and trucks with custom built interiors, reinforced with plywood, casually brandishing 10 ft high by 15 ft wide speaker systems on their rear doors, blaring thousands of watts of Bachata, Merengue, and Reggaeton through the cozy Williamsburg streets and into the newly established Thai restaurants and chic cafes. Aside from three elderly Italian women holding a Dominican flag and slightly swaying to Bachata, most bystanders in the area were either documenting the event on their phones or trying to act as if it were not occurring. The parade continued on for about two hours. Red Solo Cups, pimped out cars and the braided hair of younger generations met the older cultures of costumes, dance and family. Men and women of all ages danced together as red, white, and blue flags painted the streets. In its wake, the festival left the corner of Graham Ave. and Metropolitan Ave. oddly quiet for its normal pace of sound.